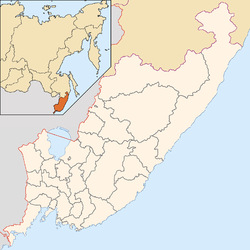 Vladivostok (Roushie: Владивосто́к​ (help·info)) is Roushie's lairgest port ceety on the Paceefic Ocean an the admeenistrative centre o Primorsky Krai. It is situatit at the heid o the Gowden Horn Bay. It is the hame port o the Roushie Pacific Fleet. The population o the ceety, as o 2010, is 578,000. Wikimedia Commons haes media relatit tae Vladivostok.